Nintendo has officially revealed the launch and release date for the their new 3DS handheld at press conference in Tokyo. 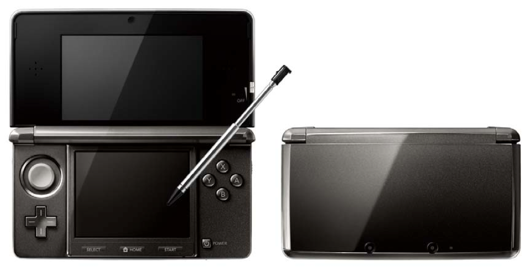 However, as of yet there is only a solid date of February 26, 2011 for Japanese consumers, with a North American launch slated for March 2011. The device will sell for ¥25,000 (approx. USD$300) and will be available in the two colors shown in the images above and below, “Cosmos Black” and “Aqua Blue”. In the box (for the Japanese release, at least), will be the 3DS itself, a charging dock, telescoping metal stylus, and a 2GB SD card. The company also detailed some OS and software features including the ability to download Game Boy Advance and original Game Boy games through a Virtual Console-like store. Also shown off was a six “paper cards” that come with the device, used for playing built-in augmented reality games using the 3DS’ outward facing camera to detect the cards and replace them with on-screen objects. 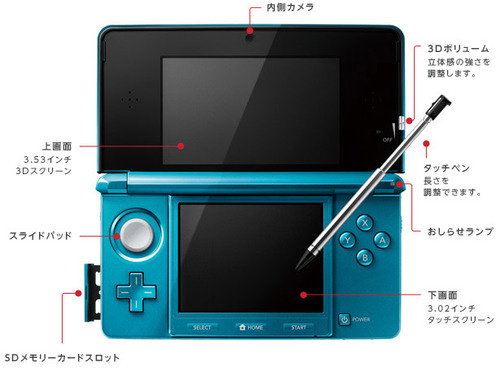 Other pre-loaded software includes “Mii Studio” (to take 3D pictures and create your Mii), “Chance Encounter Mii Plaza”, “Book” (which is though to be an e-reader of sorts), and “Nintendo 3DS Sound” and “Nintendo 3DS cameras”.